In the century since the world was torn apart in the Fracture, nearly all civilization and technology have been swept away. Mankind has been brought to its knees, leaving the world's population a remnant of what it once was. Now, with the earth quietly slumbering once more, her remaining human children continue to rebuild with precious little knowledge of the old world. In the tradition of those brave souls who first ventured out into the devastated landscape, Davis travels the ancient roads, not much caring where his steps take him, so long as it is away from his troubled past. 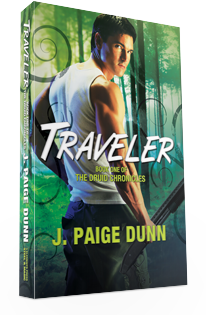 When a mysterious young woman crosses his path, claiming to be a druid with magical powers, Davis has a difficult choice to make — Should he help in her quest to heal the world of devastation, or follow his own will, continuing to lead the life of a Traveler? Once he is admitted into the world of the druids, Davis realizes that at least in this place, people have not only weathered the storms of the Fracture, but have thrived because of it. With control over the elements bestowed upon them by the gods, the druids of Oak Grove live their lives in relative peace, without struggle for food, shelter, or any other necessities of life. All is not idyllic, however, for it is a community ill at ease. For nearly twenty years, scores of young men have been denied their magical heritage by parents who have bowed to the ArchDruid’s tyrannical demands. Angie continues her quest to lead her people in a return to the old ways, so that men and women can be equal once again. While he knew his presence would not be welcomed by some, he hadn't counted on landing in a hotbed of druid politics laced with magic, through which he must carefully navigate, lest he give the inimical ArchDruid a reason to get rid of him — permanently. Finding himself squarely in the center of the struggle, Davis discovers that he will have to work harder than ever to keep Angie by his side. It is a test that will require all his wits and courage if he is to remain in his position as her Warrior. 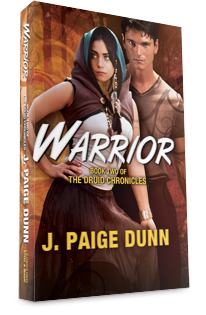 Now that Davis possesses elemental magic of his own, he is determined to return to White Oak Grove and rescue his chosen, Angelina Everlight, from the evil machinations of the tyrannical ArchDruid. Before he can proceed, however, there is the small matter of learning to use his gods-given magical ability – which proves more difficult than he had anticipated. Struggling with the desire to return to Angie and the realization that he is no good to her unless he can control his elements, Davis takes on the task with his usual intensity. To complicate things further, former ArchDruid Connor Shitozaki has other plans regarding the Finns, Davis, and the grove he once led. What starts out as a relatively casual trip to gain combat experience for the Finns turns out to be a months-long series of battles involving the bandits from the ‘Ville and the Witches of Ward, as well as seeing the return of some old friends. As the road stretches ever longer, leaving Angie farther behind him, Davis frets over whether he’ll be reunited with her before a year and a day is up, or if she will be lost to him forever. Larger forces are at work, however, for the young elementalists of the grove have started to seek out their chosen warriors, instigating a series of events that could very well lead to a conflict between the grove and Shitozaki’s splinter faction of magic-wielding young men. Davis and his friends will need all their wits and fighting ability, as well as the help of the gods, to survive a war against insurmountable odds.